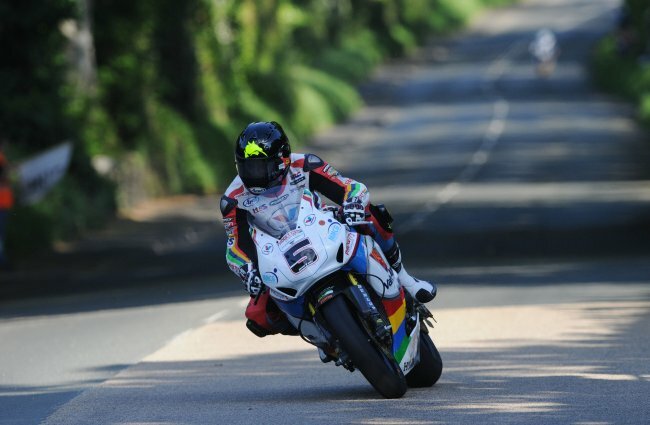 Clear blue skies and sunshine on Monday evening meant the 2014 Isle of Man TT Races, fuelled by Monster Energy, got underway at last and Bruce Anstey set the pace at 127.473mph just edging out fellow Honda rider John McGuinness whose best lap was 126.355mph. Action around the Mountain Course commenced at 18.25 with the newcomers completing their controlled laps after the cancellation of Saturday’s session. Richard Quayle led the first group of three away, Peter Hickman, Laurent Hoffmann and Martin Jessopp, followed by the recently retired Ian Lougher with Phil Crowe, Vick de Cooremeter and Alan Bonner, and finally John Barton with Danny Webb, Dan Kruger and Callum Laidlaw for company. Shortly before 7pm it was the turn of the ‘big boys’ with William and Michael Dunlop leading the field away followed by Michael Rutter and Guy Martin, Dan Kneen and James Hillier, Ian Mackman and Josh Brookes, David Johnson and Steve Mercer and Lee Johnston and Ian Hutchinson. All were on their Superbike machines with the exception of William Dunlop and Mackman who opted for their Superstock mounts. McGuinness left the line in the 11th pairing but two men who ran into trouble on their opening laps were Martin who was soon back in the pits and going out on his Superstock machine and Dan Stewart who wasn’t so fortunate, being stuck out at Douglas Road Corner, Kirk Michael for the session. Michael Dunlop was the first man to complete a lap at 125.265 followed by brother William (122.461), Rutter (122.789) and Kneen (123.580). 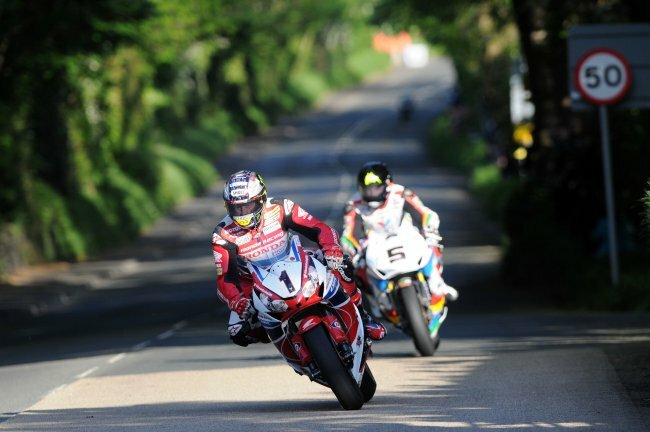 McGuinness was on the pace at 123.641 as was Gary Johnson, who left the line mid-pack, at 124.513. Second time around and McGuinness and Anstey went top of the timesheets at 126.355 and 126.299, the duo circulating in close formation, with Johnson also going quicker than his opening lap at 125.686. The newcomers were also picking up their speed on their second official laps, Jessopp on 109.674 and Hickman 109.039. 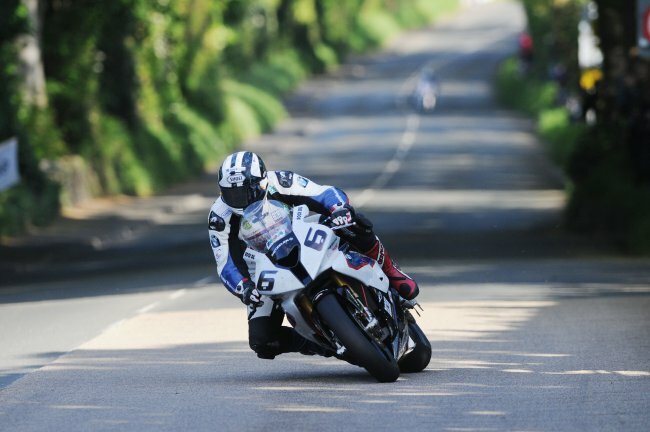 McGuinness remained second on the leaderboard followed by Johnson, William Dunlop (125.400), Michael Dunlop (125.335) and Rutter (124.740). Impressive laps continued to be posted by the newcomers, none more so than Hickman whose lap of 115.103 was the quickest ever by a debutante on their opening night of practice. Fellow BSB rider Jessopp wasn’t too far behind on 113.293 but sandwiched in between was Belgian Hoffmann on 113.354. The Dunlop brothers topped the Superstock times, Michael’s lap of 123.239 seeing him seven seconds clear of William at 122.461. Aussie David Johnson and Austrian Horst Saiger made it an International top four while Gary Johnson was quickest in the Supersport class after a late lap of 122.619mph, a solid start for the Smiths Triumph concern. 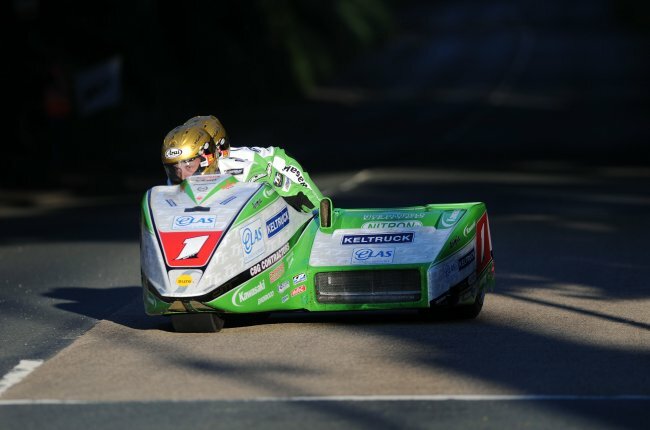 The solo session finished at 20.05 and, with their newcomer laps safely completed at the beginning of the evening, the Formula Two Sidecars first official session was soon up and running with Dave Molyneux/Patrick Farrance, Ben and Tom Birchall and John Holden/Andy Winkle first away. Molyneux was first back, and comfortably quickest, at 112.278 followed by the Birchalls (108.690), Karl Bennett/Lee Cain (107.452), Frank Lelias/Paul Knapton (107.035), Gary Bryan/Jamie Winn (105.835) and Conrad Harrison/Mike Aylott (105.366). Tim Reeves, on a DMR outfit for the first time and with Frenchman Gregory Cluze for the first time since 2012, had a steady opening lap of 103.766. Molyneux and Farrance really upped the pace on their second lap with a speed of 114.350, their quickest opening night speed ever, whilst the Birchalls quickened their tempo also with a 110mph+ lap. Equally impressive was the lap by the father and son pairing of Ian and Carl Bell, a speed of 107.254mph placing them fourth on the leaderboard while Carl Fenwick/Phil Knapton (106.532) slotted into sixth behind Lelias. Tony Thirkell/Nigel Barlow were reported to have had an incident at Sulby Bridge and while Thirkell was unhurt, Barlow was taken by airmed to Nobles Hospital with reported ankle injuries.